JESSIKO is an underwater robot which uses fins to move through the water. 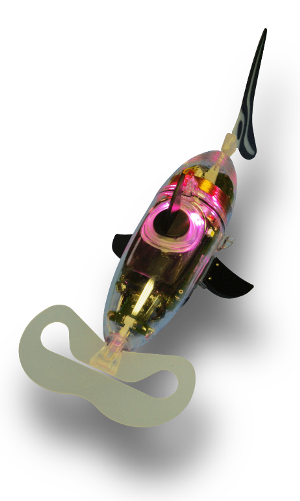 The project started in 2005, when Christophe Tiraby, an engineer in the industry, confirmed the feasibility of a small robot fish with the ability to swim autonomously for hours. Since then, several versions have been built, currently V5, the first series version manufactured for Yeosu World Expo. JESSIKO is a highly sophisticated innovation with 3 international patents. A service for events, shows and commercial events exhibitors... Jessiko Fantasy is an unique original performance. An advanced and original platform with cutting-edge technology. Robotswim uses optical systems to meet the needs of communication and localisation in aquatic environment. Robotswim offers service agreements for industry and research laboratories. Robotswim is an innovative company who wants to set new objectives for the robotic market by taking advantage of its team's expertise in the embedded hardware and software design of small robotics products. Robotswim is constantly on the outlook for skilled employee profiles to expand the team.